Say it with me now..... "Fun Factor"
The first scooping was a quick sample while I prepped a bowl for my daughter, and to put it simply, I like it, as did my daughter. Yet again this has that fun buttermint vibe that reminds me of my childhood (and also drives Nick crazy). 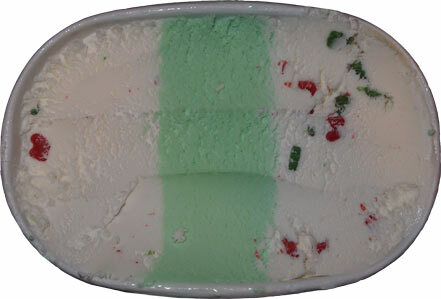 The base isn't as dense or texturally significant like it's Talenti counterpart, but it's a nice minty bang for the buck. Further scoopings were pleasant as well. 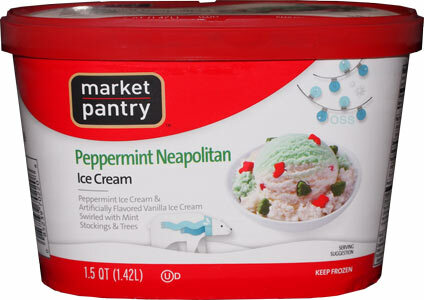 While I do have the semantic urge to knock Target for calling a two flavor mix "neapolitan", the overall product is still fine. While the white sides are just vanilla, they're flavoring becomes instantly minty when chowing down on the plentiful red stockings and green trees. We've met these types of sugary mix-ins before, but I think Target has nailed the size and thickness here. They are finally big enough to add flavor and texture in a nice way. Sure you could add more thin chunks for a similar effect, but I just really fancy the way they've done it here. They are mini buttermints and I'm a huge fan. So, that's that I guess. Not a particularly heavy or dense ice cream, but the lighter texture goes well with the flavor as well as the chunks. I have no problem recommending this fun inexpensive flavor. Verdict? Fun Factor! Buttermint! Cheap!